Smartphone shipments fell to 334.3 million in the first quarter of this year, down 2.9 percent compared to the same period last year, according to a new report from International Data Corp. (IDC). Sales in China, where shipments dipped below 100 million for the first time since 2013, are largely behind the drop. "Globally, as well as in China, a key bellwether, smartphone consumers are trading up to more premium devices, but there are no longer as many new smartphone converts, resulting in shipments dropping," said Melissa Chau, associate research director with IDC's Worldwide Mobile Device Trackers, in a prepared statement. "When we look at it from a dollar value perspective, the smartphone market is still climbing and will continue to grow over the years to come as consumers are increasingly reliant on these devices for the bulk of their computing needs." With 78.2 million shipments in the most recent quarter, Samsung led the market with a 23.4 percent market share. The company's shipments were down slightly from 2017's first quarter, when it sold 80.1 million devices, and mostly steady in terms of market share, up only a tenth of a percent year over year. "The new S9 and S9+ led the way as the new flagships launched a quarter early for the Korean giant compared to last year's S8/S8+," according to IDC. "Although the new flagships shipped late in the quarter, brisk initial sales of the new devices kept the overall yearly decline at a minimum as the bulk of the positive impact is expected to arrive in Q2 2018. Despite the late launch, the high-priced devices should significantly boost average selling prices (ASPs) in the quarter for Samsung. Outside of the new flagships, the A series and J series continued to drive most of the key volume in both developed and emerging markets." Apple took the second spot with 52.2 million sales and a market share of 15.6 percent, both improvements over last year's first quarter when the company 50.8 million devices for a 14.7 percent share of the market. "Despite rumors of an underperforming iPhone X in the quarter, Apple stated that the iPhone X was the most popular model each week in the March quarter," according to information released by IDC. "The success of the more expensive iPhone X combined with healthy sales of the iPhone 8 and 8 Plus helped grow ASPs 11.1 percent to $728, up from $655 last year. Rumors of three new bezel-less iPhones arriving this September are expected to bring new features such as a larger AMOLED display model, a more affordable mid-tier model, and increased performance and imaging capabilities across the board." Huawei saw a year-over-year improvement of nearly 14 percent, from 34.5 million sales to 39.3 million, and a bump in market share from 10 percent to 11.8 percent. "Huawei climbed to a new market share high of 11.8 percent even as it remained in third overall," according to an IDC news release. "Huawei has toed the line between maintaining a strong domestic position while slowly upscaling its brand image in international markets with dividends paying off as it beat the average global growth rate, reaching 13.8 percent year over year. While its high-end smartphones are popular in China, the bulk of its shipments are of the more affordable class of smartphones, and it also introduced a few new models in the low-end and mid-range segments." Xiaomi took the fourth spot with 28 million sales and a market share of 8.4 percent, both nearly double its numbers in the first quarter of 2017, when it sold 14.8 million devices for a 4.3 percent share of the market. "Xiaomi's strong performance has no doubt been due to its strong growth outside of China with 1Q18 the first quarter that less than half of its shipments were domestic, a transition that very few Chinese companies have reached," according to IDC. "Xiaomi continues its retail expansion in India and Southeast Asia; however online channels remain the key contributor in India, its second largest market. Its low-end Redmi 5A made up almost two-fifths of its volume in India." Oppo closed out the top five for the quarter, with 23.9 million shipments and a 7.1 percent share of the market, down from 25.8 million sales during the same period last year, when it had 7.5 percent of the market. "Oppo held the fifth position with its year-over-year decline of 7.5 percent more a result of the China slowdown than of its performance overseas, as both share and shipment volumes abroad increased in the first quarter," according to an IDC news release. "OPPO has also pruned some of its retail partnerships to focus on those with higher contribution to sales." "Despite new flagships from the likes of Samsung and Huawei, along with the first full quarter of iPhone X shipments, consumers looked unwilling to shell out big money for the latest and greatest devices on the market," said Anthony Scarsella, research manager with IDC's Worldwide Quarterly Mobile Phone Tracker, in a prepared statement. 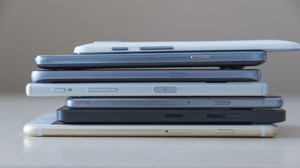 "The abundance of ultra-high-end flagships with big price tags released over the past 12 to 18 months has most likely halted the upgrade cycle in the near term. It now looks as if consumers are not willing to shell out this kind of money for a new device that brings minimal upgrades over their current device. Looking forward, more affordable premium devices might be the solution the market needs in the second half of the year to drive shipments back in a positive direction."